No knitting for ages, and a neglected knitting blog as other activities have taken over. My art print business, Go To Design, has kept me busy with a load of trade orders. 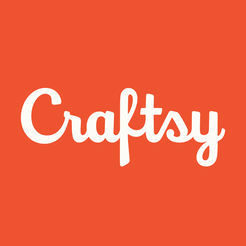 Great news for the art biz, but curtains for the knitting, for the time being. I have a full-time day job too, which quite often takes me away from home. The joy of the last few months, however, has been my new dog-walking gig with the Cinnamon Trust. Every Saturday I walk Meggie, a classic black and white collie, and Badger, a black field spaniel. They are adorable and so different. Meggie is very engaging and just wants to play ball. She doesn’t care where we are, as long as I am throwing a ball or a stick for her. In fact she is so ball-obsessed that I have to watch out for kids in the park playing football, because she will invade the pitch. She looks at me all the time and I talk to her constantly. She is wonderful and I am a little bit in love with her. Badger is not interested in balls, sticks, or me. He just wants to scurry about following scents in the bushes. His recall isn’t great. 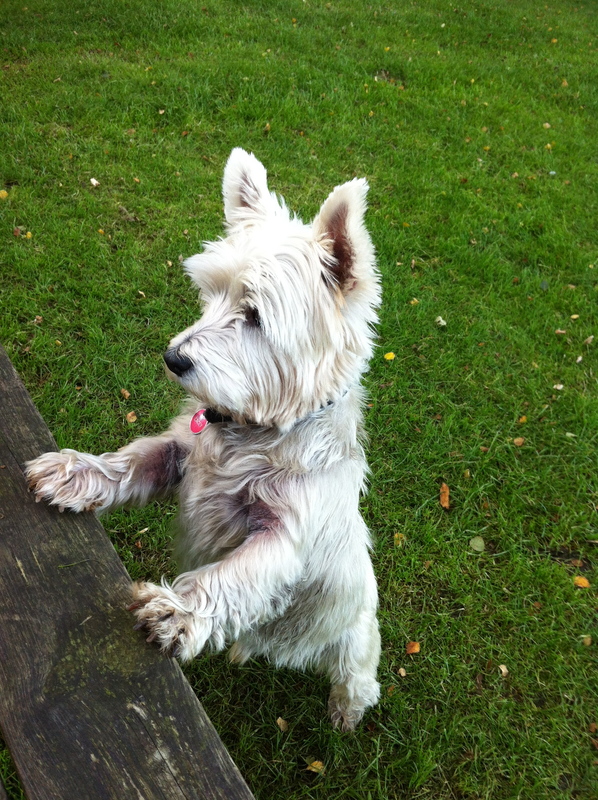 He has been known to chase squirrels or rabbits and he once stole a chicken from someone’s back garden (not on my watch – and the chicken was OK). So we have made a deal. He is off-lead in the park where we begin and end our walks every week. Then for pastures new he is on a long lead and I do my best to keep up with him. When we sit down for a rest he leaps into my lap and snuffles for a treat. I have to plan the walks to cater for their different interests. Meg needs a big space to run in, and Badger prefers footpaths in fields or woodlands. He also loves water, especially in the hot weather. He can’t wait to find a river and jump in it. I’ve found the ideal walk for us – at Rivelin Valley in Sheffield. The river goes along the valley floor through stunning woodlands, with rocky paths and little bridges. There are lots of shallow places where they can go for a paddle and a sit down. Today they spent most of the walk trotting through the river. Sunday is my dog-walking day. I walk Harry and Dixie, a pair of West Highland terriers, for their owner Ken. I like to give them a good 2 hours off the lead, so we take a short drive to where we can have a good run away from any roads. 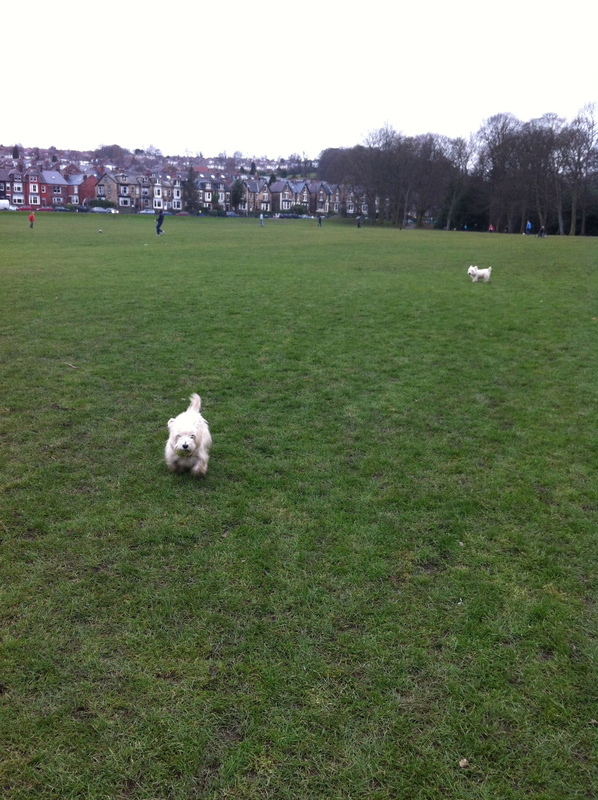 Here we are on a jaunt around Endcliffe Park in Sheffield. Just for fun we like to have a game of chase where I run away from them, and they run after me, round in circles. It’s good for me to have a run as well. Simple pleasures! Ken is a very experienced dog owner having had dogs all his life. He’s had Harry and Dixie from puppies and now they are 7 years old. They are extremely well-trained, well-socialised and great company. Ken relies totally on volunteer dog walkers, so sadly this means that the lads don’t get out every day. They only get walked 3 or 4 times a week, sometimes less. Sometimes it’s only a quick stroll around the block. So on Sundays I give them as much time as possible. It’s wonderful to see them run free in open spaces. There’s a nature reserve near us called Wyming Brook. The brook runs down a steep wooded hillside. 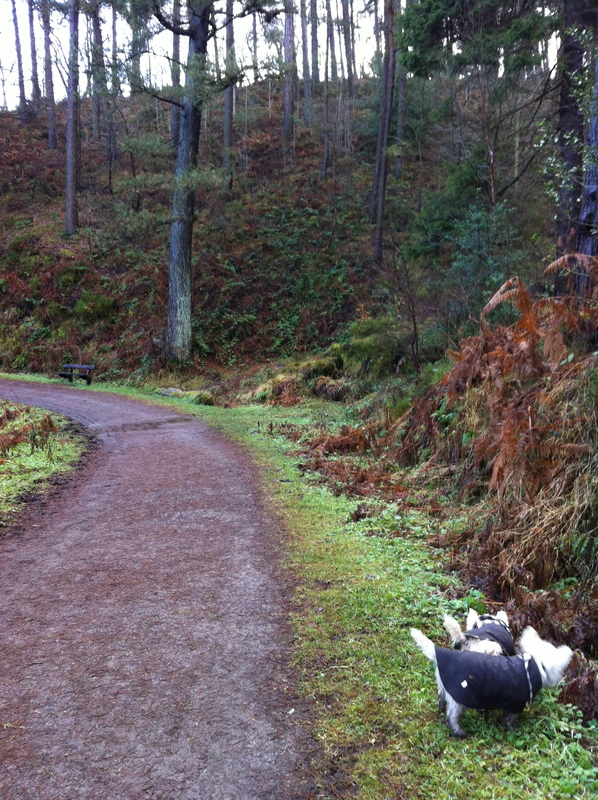 There’s a wide, winding track which leads through the trees down to the reservoir. Alternatively there’s a steep rocky footpath running alongside and criss-crossing the brook itself. Here you have to jump from rock to rock and cross rustic wooden bridges as you go, with the constant roar of the water around you, shaded by tall trees. You can go down the rocky footpath, and back up the track, or vice-versa, making a round walk. The footpath is exciting, but the track has its own charms. The trees and their alpine scent make you feel you are up a mountain, with the occasional glimpse of distant Sheffield. Harry and Dixie are game little dogs who will tackle any terrain. I don’t have to worry about them: they always come back to me when called and they are relaxed around other dogs. However, I do have to watch out for horse or fox manure because Harry is a roller. Dog walkers, you know what I mean. When this happens we divert to the nearest stream or brook to wash the worst off. Harry doesn’t much like getting wet. His brother Dixie jumps straight in, even if he’s not dirty, but Harry needs persuading. Fortunately Ken isn’t in the least bothered if I come back with two filthy dogs. As far as he’s concerned, they should be out all afternoon getting mucky. He gives me a dog blanket for the car and baths them before teatime. Harry asking ever so nicely for a crisp in the beer garden. Ken is full of appreciation for his dog-walkers. It was the Cinnamon Trust who put us in touch. They are always looking for new volunteers, particularly for dog-walking and fostering cats. If you live in the UK and if you are a pet lover with a bit of spare time, do get in touch with them. I am looking forward to this Sunday’s outing, especially now the weather is improving! We might have company, in the form of my friend, her daughter, and their little terrier Daisy. Woof!